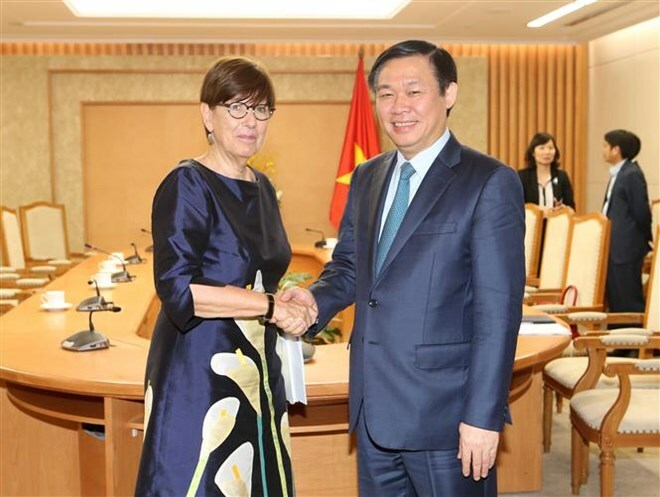 Hanoi (VNA) – Deputy Prime Minister Vuong Dinh Hue on August 23 hosted separate receptions for the Ambassadors of Belgium and Slovakia and Head of the Delegation of the European Union to Vietnam. Receiving Belgian Ambassador Jehanne Roccas, Hue lauded significant contributions made by the Belgian Embassy and the ambassador in enhancing multi-faceted cooperation between the two nations in the past years. He urged more balanced two-way trade, noting that the Vietnamese Government will send a delegation to Belgium next month to strengthen bilateral relations with Belgium and push for the ratification of Vietnam-EU free trade agreement. Ambassador Jehanne Roccas said that the two countries are enjoying fruitful economic and diplomatic relations and Belgium has poured 500 million EUR in Vietnam. 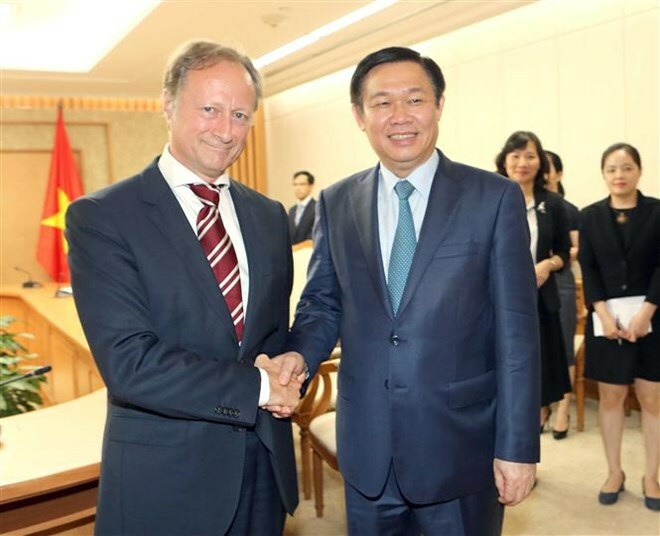 With strengths in high technology, Belgium can cooperate with Vietnamese enterprises in the field, she noted. In another meeting, Deputy PM Hue and Slovakian Ambassador Igor Pacolak agreed that the two countries need to work to intensify relations in the coming time. The two sides vowed to support businesses’ investment in technology and construction sectors. 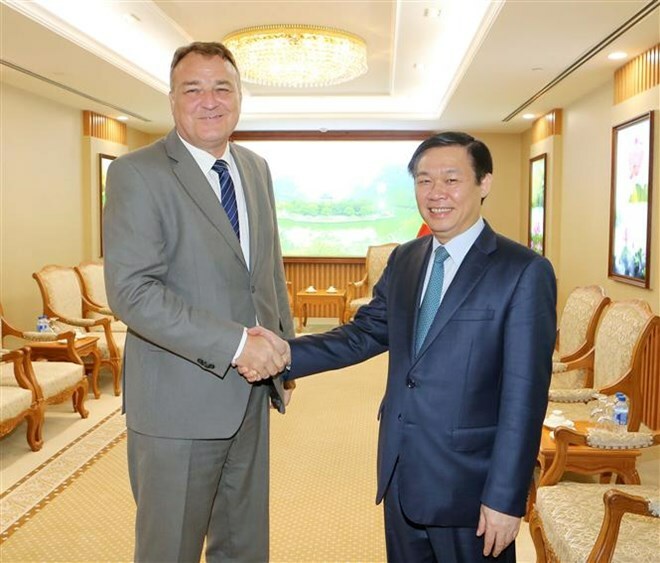 The Slovakian guest said that Deputy Prime Minister Vuong Dinh Hue’s visit to his country is significant to open up new cooperation directions between the two countries’ business communities while consolidating bilateral diplomatic and politic relations. Talking with Ambassador Bruno Angelet, Head of the EU Delegation to Vietnam, Hue underlined that Vietnamese Party, Government and people always treasure the EU’s support for the country’s development process. Vietnam is making concerted efforts to complete the market economy mechanism with a view to bolster the comprehensive cooperation relations with the EU, Hue said. He expressed his hope that the Vietnamese Government delegation’s upcoming visit to the EU will allow both sides to discuss measures to carry out their agreement on comprehensive partnership framework and accelerate the signing and ratification of the Vietnam-EU free trade agreement.